The MIDI Artist Soloist Series - Band-in-a-Box® Solos Created by Top Musicians. The soloist databases in the Artist series are created and designed by the performers themselves! Using the Soloist technology, Band-in-a-Box® will create a great solo for you for any chord changes, allowing your solo to sound like it was played by a top studio musician. $29 Buy and Download Now ! 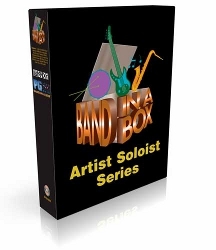 This is a Rock Guitar / Synth MIDI Soloist for Band-in-a-Box®, created by Grammy® nominated keyboard / guitarist and "Kenny G" producer Jeff Lorber. Using the Soloist technology, Band-in-a-Box® will create a screaming "Rock Guitar / Synth" solo for you for any chord changes, allowing your solo to sound like it was played by a top LA studio musician! Voted Keyboard Magazine's "Session Player of the Year," Jeff Lorber has helped define "Smooth Jazz" with his amazing keyboard playing and producing talents. With this signature MIDI Soloist disk, Jeff has personally created a dynamic Fusion / Swing-16ths groove soloist for Band-in-a-Box®. Let Band-in-a-Box® create an exciting solo for your tune based on any chord changes you enter or generate a solo for study and analysis. In this MIDI Soloist, New York recording artist Andy LaVerne performs in a contemporary Jazz Style that features the Pentatonic approach to playing. The harmonic thinking and phrasing is modern - in the style of McCoy, ChickC and JoeH. Let Band-in-a-Box® generate a solo for your tune or use it to study this exciting approach. This MIDI Soloist set is the first in the "Artist Soloist" series. These soloist databases in the Artist series are created and designed by the performers themselves! This set is designed by the great New York pianist Andy LaVerne in the Mainstream Jazz style. A veteran of groups like Woody Herman and Stan Getz, Andy has performed with all the greats in Jazz, and is featured regularly in Keyboard Magazine.